The president said the mass shooting at a gay nightclub in Orlando, Florida, was "an act of terror and of hate" while addressing the nation on Sunday. President Obama spoke from the White House on Sunday about the mass shooting at an Orlando gay nightclub that killed 50. (Image via BBC News). WASHINGTON: President Barack Obama addressed the nation on Sunday afternoon about the mass shooting at a gay nightclub in Orlando overnight. Fifty people were killed and 53 were wounded, making it the deadliest mass shooting in American history. Omar Saddiqui Mateen, who has been identified as the shooter, reportedly called 911 and expressed solidarity with the Islamic State and the Boston Marathon bombers, according to media reports. 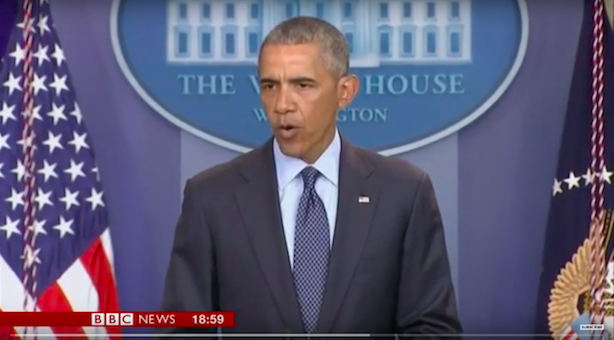 "Although it’s still early in the investigation, we know enough to say that this was an act of terror and an act of hate, and as Americans we are united in grief, in outrage, and in resolve to defend our people," Obama said during the address. (Video below via BBC News). The presumptive candidates of both major parties, former Secretary of State Hillary Clinton and businessman Donald Trump, both addressed the event on Twitter on Sunday morning. Trump was criticized on social media for the seemingly self-congratulatory nature of his tweet.